A tender chemistry: Corrie Tan reviews the premiere of Stewart Pringle’s Papatango Prize-winning play. 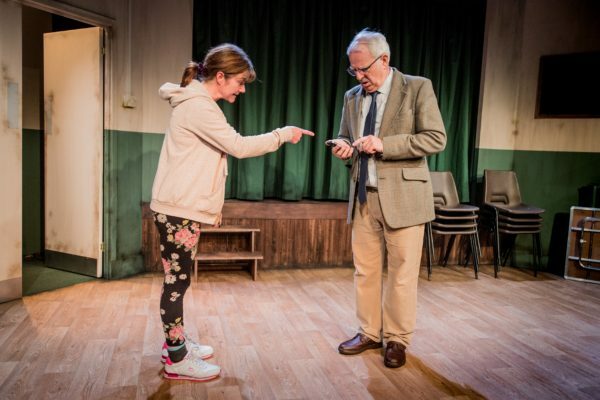 Trestle at the Southwark Playhouse. Photo: Robert Workman. Behold, the Manic Pixie Dream Girl has grown into a Manic Pixie Dream Woman. She’s now in her sixties, wears bright floral yoga leggings, eats sandwiches with two spreads, and teaches a weekly zumba class at her local community hall. She’s the feisty, flame-haired Denise, and when she sweeps into the shabby meeting room where Harry – also in his sixties, and perfectly dressed and pressed – is tidying up after what appears to be some sort of council or committee meeting, their meet-cute sets the stage for a possible 500 Days of Summer of the Golden Years. Their relationship unfolds over the course of this weekly in-between, the five minutes after Harry’s meeting ends and the five minutes before Denise’s zumba class begins, amidst unstacked plastic bucket chairs and the unwieldy trestle table from which the play takes its name. As the pair muddle through charmingly awkward misunderstandings and sweet shared lunches, their friendship begins to expand beyond the borders of this sliver of alone time. Stewart Pringle’s Trestle is the winner of the 2017 Papatango New Writing Prize, and it’s a very likeable two-hander exploring a burgeoning friendship between two retirees who are rediscovering life after decades at work or in marriage. Given the conceit of the recurring meeting, week after week, within the same space, Pringle does his best to flesh out his characters and the trajectories they take over time within this short glimpse of their friendship as it matures. The play does feel like a bit of an hors d’oeuvres from time to time, skimming the surface of the change of pace that comes with growing older. There are hints at each character’s loneliness and what they try to do to stave off those encroaching shadows of mortality; Gary Lilburn is disarmingly self-conscious as the dutiful widower Harry, and Connie Walker brings an infectious energy to the stage as the opinionated, freewheeling Denise. Together, they share a tender chemistry, elevating the play beyond its otherwise light give and take, and attempting to direct it a little bit deeper. As they banter and bicker within the confines of the fluorescent-lit meeting room, its exit sign casting a green hue over each scene change, there’s a bittersweetness to their extended encounter, each with one foot over the threshold and the other out the corridor, entering and exiting each other’s weekly routine as they approach a period of life where any exit could be a permanent one. Trestle is an understated, gentle approach to making connections – and treasuring those connections later in life. Trestle is on until 25 November 2017 at the Southwark Playhouse. Click here for more details.